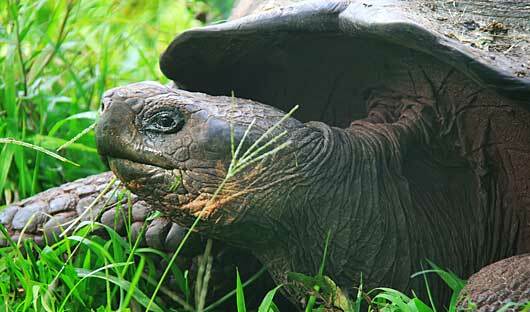 Discover the Galapagos Islands as part of your tailor made tour. 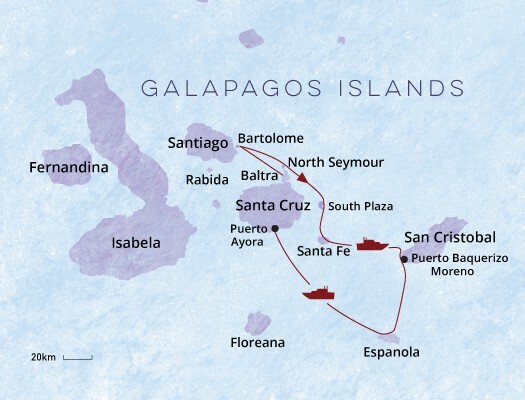 South America Travel Centre uses the very best operators in the Galapagos Islands and we can incorporate this Classic Galapagos voyage or a shorter or longer voyage into your tailor made itinerary. 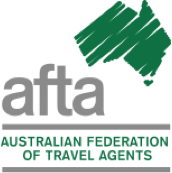 Contact us to create your own customised tour. Morning flight from Quito or Guayaquil to Baltra Island (Galapagos). Arrive at Baltra in the morning where you will be met by a local representative for transfer to the catamaran. You will have some time to settle in before lunch and a welcome briefing. In the afternoon visit to Las Bachas Beach, a swimming beach on the northern shore of Santa Cruz. One of the few remnants of the U.S. World War II presence in the Galapagos – a floating pier – can be seen here. 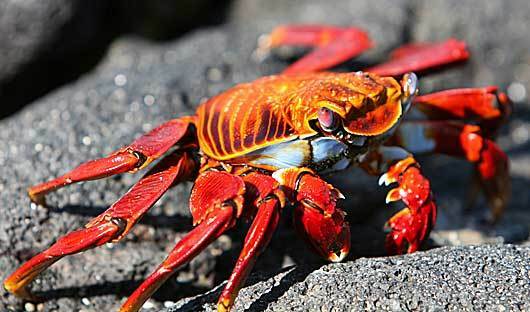 You may see flamingos, Sally Lightfoot crabs, hermit crabs, black necked stilts, and whimbrels. Sea turtles also nest off the beach. In the morning, head to South Plazas Island. This small island with steep cliffs was formed by rising lava and is now covered by Opuntia cacti. It is also home to one of the largest sea lion colonies as well as colourful yellow and red land iguanas. Your afternoon visit is to Santa Fe Island, home to a picturesque bay and anchorage on the island’s north-east coast. The bay has two visitor trails, one leading to a scenic viewpoint atop a cliff and the other stretching from a small beach to a tall prickly pear cactus forest. The Santa Fe land iguana may be seen here – a species that is found on no other island in the world. Other attractions include a sea lion colony, white-tipped reef sharks, marine iguanas and of course, birdlife. 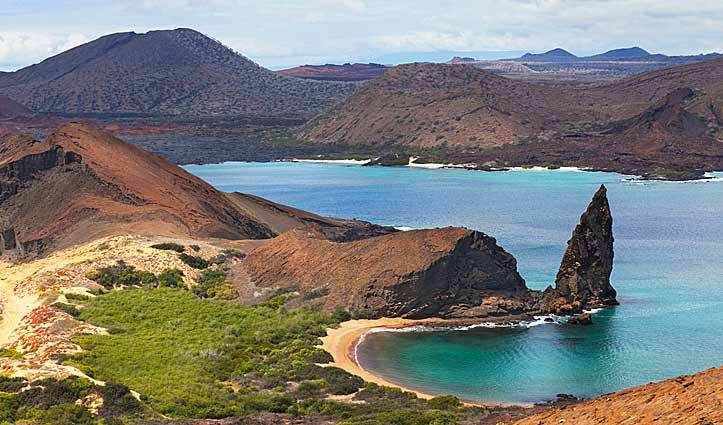 Visit Cerro Brujo (Witch Hill) in the morning where you will explore one of the nicest beaches in the Galápagos you’ll be tantalised by the texture and sight of the powdered, soft white sand. With a colony of sea lions and blue-footed boobies, this scenic place is bustling with life. Just beyond the beach is a lagoon, thriving with egrets and Great Blue herons. The turquoise water and abundant marine life will invite you to snorkel in their midst. Galapagos 2In the afternoon visit Punta Pitt. After an easy hike, you will be rewarded with a treat as as this is the only place you can see all three species of Galapagos boobies at the same time – red-footed and blue-footed as well as Nazca boobies. Photographers will be thrilled with this intimate natural experience and the volcanic tuff formations will have geologists and laymen alike imagining the forces of nature that possessed the earth to create this land. In the morning drive to Cerro Colorado, a visitor site in the south-east of the island around an hour’s drive from capital of the Galapagos, Puerto Baquerizo Moreno, and in the surrounding trees and shrubs along the way you may see land birds like warblers, finches and mockingbirds. Here at the breeding centre, La Galapaguera,you will make a short visit to see the emblematic reptiles of the Galápagos – the Giant tortoises – as well as deciduous forest, land birds, and endemic plants. 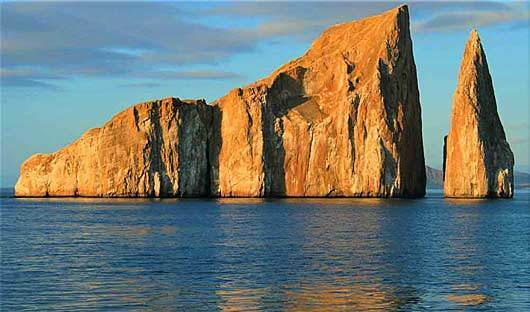 This afternoon, take a panga (Zodiac) ride around nearby Kicker Rock (Leon Dormido), a magnificent rock in the middle of the sea. Rising 152 metres straight up from the ocean, this giant rock has the shape of a sleeping lion and has a split with towering vertical walls on either side, forming a narrow channel through which small vessels can navigate – truly a Galapagos tour spectacular. On the cliffs, you may spot blue-footed boobies, Nazca boobies and magnificent frigatebirds. Below, the clear waters offer a brilliant show of tropical fish and invertebrates. 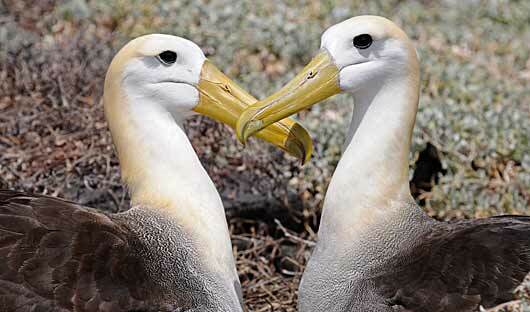 Espanola Island is the southernmost island of the Galapagos and is the breeding site of nearly all of the world’s 12,000 pairs of Waved albatrosses. It is is densely populated with mockingbirds, blue-footed and Nazca boobies, Darwin finches, Galapagos doves, hawks, red and green marine iguanas, and loads of sea lions. 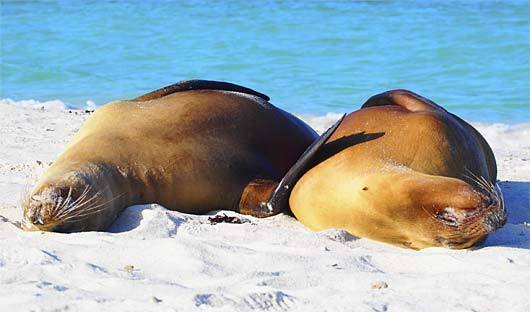 In the morning, land at the spectacular Gardner Bay and walk across a lovely white sand beach amid a busy sea lion colony or dive into the water to swim with sea lion pups. In the afternoon, visit Punta Suarez and hike along a trail where you will have the chance to see blue-footed boobies, albatrosses and Nazca boobies. Also visit a site on the ocean front to a cliff which large albatrosses use as a launching pad! And you’ll have the chance to see the famous blowhole that shoots a water spout 22 metres into the air. You will visit two sites on Floreana Island. The island is known for its great snorkelling sites, its vibrantly pink flamingos and its black sand beaches. Baroness Viewpoint – a lookout named for the self-styled Baroness von Wagner who arrived in the 1930s with her three German lovers, and plans to build a hotel for wealthy yachtsmen – is a fantastic place to take it all in and your guide will tell you about the murder and mystery that relates to its history. There are easy trails in this area for exploring the flora and fauna of Floreana. Then visit the famous Post Office Bay – you will land on a beach and head to a spot where 18th century whalers placed a wooden barrel for use as an unofficial mail box. The custom continues to this day with Galapagos visitors, so don’t forget your postcards, and don’t be surprised if the postcard arrives at its destination before you even get home. 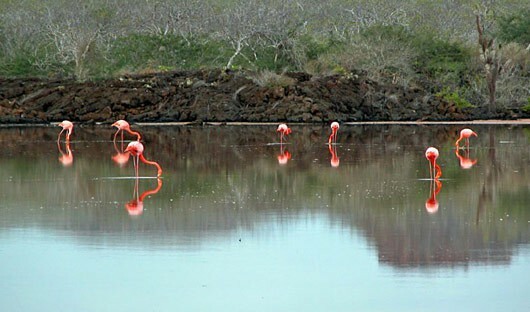 In the afternoon, head to Punta Cormorant and enjoy a hike to a salt-water lagoon which is home to flamingos. 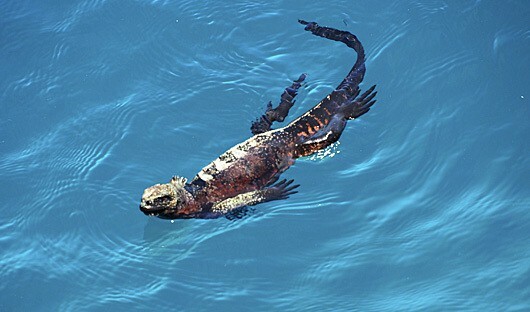 You will also have the chance to swim in one of the best snorkelling sites in the Galapagos. After arriving back at Santa Cruz Island and disembarking in Puerto Aroya, visit the renowned Charles Darwin Research Station, home to turtles ranging from 8cm (new hatchlings) to 3.5m long. Here you will learn about the conservation and research efforts taking place on the islands, such as the tortoise breeding and hatching programs that are saving several species of tortoise from extinction. After this final visit, you will be transferred to Baltra Island’s airport in time to catch your flight back to the mainland. Please note: Itineraries and activities are subject to change without prior notice. Depending on weather conditions and water currents, some wildlife described above may not be seen.